A couple pioneers in neighbor island hospitality stand out in Hawaiʻi’s early fledgling visitor industry. At the time, emphasis and facilities were focused in Waikīkī. However, two locally-grown chains saw the opportunities and put their attention on the neighbor Islands. Attention to the neighbor islands was not their only similarity. Each started as locally-owned and family-run. They grew to provide more than just a place to sleep and eat – their operations included tours and travel. Sadly, they are both gone. Here’s some background on each, as well as the connection that existed between them. Walter Dudley Child, Sr. came to Hawaiʻi in the early-1920s; he first worked in the agriculture industry with the Hawaiʻi Sugar Planters Association (HSPA.) After a decade, he left HSPA and entered the hotel industry, purchasing the Blaisdell Hotel in downtown Honolulu; he later bought the Naniloa Hotel in Hilo. Lyle Lowell “Gus” Guslander, started in the hotel business as a bellhop and cook. After studying hotel operations at Cornell University, Guslander was in management at the Palace Hotel in San Francisco, eventually working his way up to become assistant manager. In 1947, Guslander came to Hawaiʻi and worked at the Niumalu Hotel for Walter Child, Sr. Both were characterized with short fuses and it didn’t take long for a disagreement to come between the two and Child “canned” him. Guslander moved to the Moana Hotel as assistant manager. Then Guslander set out on his own; he initially leased, then purchased the 24-room Coco Palms Lodge on Kauaʻi – and later expanded it to nearly 400-rooms, naming it, simply, Coco Palms. He hired Grace Buscher to run it; he later married her. Movies and television shows were filmed at the Coco Palms – Elvis Presley filmed the finale of his film “Blue Hawaiʻi” there in 1961, immortalizing its lush coconut groves and picturesque lagoons. As the Coco Palms became successful, Gus expanded his operations eventually acquiring hotels on Kauaʻi, Oʻahu, Maui and the Big Island of Hawaiʻi under the Island Holidays chain, with several of the hotels under the “Palms” brand. Guslander also recognized, with his growing hotel operations, the need to expand in service and formed Island Holidays Tours. He had help from Myrtle Chun Lee. In 1969, Guslander sold his operations to Amfac Inc and stayed on as an Amfac vice president until his retirement in 1978. In 1992, Hurricane Iniki severely damaged Coco Palms Hotel, several attempts have been made to repair and revive it (recent news suggests it will be coming back.) Gus died in 1984 at the age of 69, and Grace died in 2000 at 76. In the 1950s, 60s and 70s, these two chains pioneered neighbor island hotel development – and for a while, competed head-to-head. Later, the mega-multi-national chains – Sheraton, Hilton, etc – entered the Hawaiʻi market. A few other island hotel chains were/are also part of the Hawaiʻi hotel experience, i.e. Outrigger, Aston and others – (many were more Waikīkī focused) but I’ll save those for other stories. 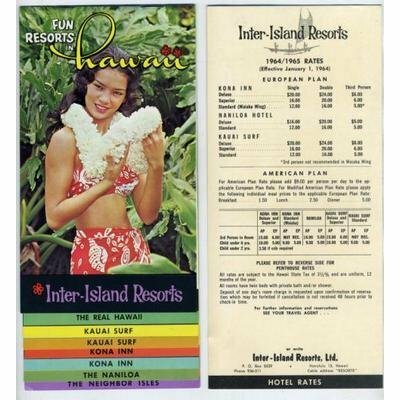 The image shows an Inter-Island Resorts Brochure (1964-1965.) In addition, I have added other images in a folder of like name in the Photos section on my Facebook and Google+ pages.